Long before the internet made such programming largely irrelevant, local community access channels (usually found broadcasting at 10 on the dial) aired low-budget filler designed to educate and inform viewers between bouts of scrolling TV listings. Quite often the shows were “interactive,” meaning they took phone calls from viewers live to air, with nary a time delay to prevent embarrassing on-air meltdowns, shenanigans or foul language. Thanks to having virtually no budget, these shows were beset with technical difficulties, poorly lit sets, and hosts and guests who were not quite ready for primetime, thus ensuring their place in the annals of charming, rubbernecking, must-see, train wreck TV history. Scarborough Cable 10 had already influenced the comedy gold of ’90s titans and Scarborough natives Jim Carrey and Mike Myers (whose Wayne’s World is about as on-point an homage as it gets), and was well known for The Rob Cormier Show and the guys who played table Hockey in their basement. Not long after, CUC Broadcasting rebranded the channel as Trillium Community 10. Debuting on Trillium 10 sometime in late 1992, Ten Forward (see what they did there?) billed itself as community based interactive show designed to spur discussion about “Star Trek, space and technology”, but aside from a few visits to the sadly now defunct McLaughlin Planetarium the show was obviously ALL about Star Trek. Just check out those uniforms. For two hours on Friday nights, 10pm until midnight, the hosts would open up the phone lines to argue the toss about Trek minutiae, ranging from obsessing over minor continuity errors to heartfelt debates about the place of religion in Gene Roddenberry’s vision of the future. Callers to the show included dopey late night shift workers, Forever Knight fans, squeaky-voiced teens concerned about violations of the Prime Directive, lonely women inquiring about the marital status of Jonathan Frakes or Brent Spiner, barely comprehensible weirdos who frightened even the rabid hosts, and not surprisingly, a legion of crank callers. One can only imagine what it might have been like stumbling across this bizarre program late at night, boozed up and without a concern in the world. It even became somewhat of a cruel sport, as rival gangs of crank callers posed ringer questions before dropping their inevitable F bombs. Full marks to the subtle Pickering crew who managed to sprinkle coded esoteric messages into their banter while on air; Scarborough area cranks seemed to be much more blunt. As juvenile as they were, the drama of not knowing if a call was legitimate or an attack made for compelling television. At times the series’ host “Captain John” seemed almost to be challenging the little punks to call in and say their piece, daring them to try and get past his spry trigger finger. While it seems trite now, hearing the F bomb with such regularity on a TV show at the time was truly shocking, and surely questions were being asked by Trillium brass behind the scenes (the program was in fact rerun throughout the week, with offending calls edited out, making for much shorter episodes). It is easy 20 years later to laugh at the “nerds playing dress-up in their parents’ basement” aspect to all this, but at the time the series was actually a fairly useful service for fan(atics) of Star Trek. Without the aid of the internet, Captain John was able to breathlessly report all the latest Trek news and gossip, dropping hints about upcoming guest stars and release dates for books, videos, and various bits of merchandise. 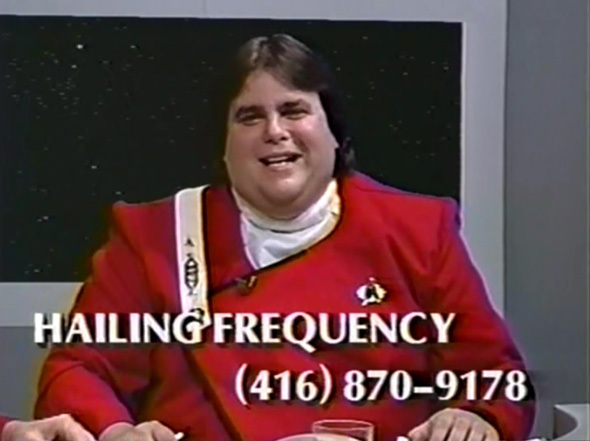 Captain John remained at the helm of Ten Forward throughout its entire run, while his co-hosts changed from “Commander Bob” to “Ensign Andy” to “Lieutenant Sue.” When Shaw Communications bought CUC in 1995 (Rogers acquired it later in 2000), Ten Forward was beamed away, sucked into a wormhole of corporate maneuvering and a changing TV landscape. It’s actually somewhat miraculous the show lasted as long as it did, likewise impossible to imagine it in a post-1995 internet gazing world. Thanks to the archiving alchemy of a certain anonymous Scarborough native, Ten Forward can now live on YouTube for future generations to ponder (Retrontario.com has obtained over 20 hours of it, for shame!). Fans of Star Trek: The Next Generation will no doubt be jazzed that next week sees the release of the 6th season on Bluray, re-mastered in stunning HD and boasting a Delta quadrant’s worth of bonus materials, although sadly, no episodes of Ten Forward.